The Kendall Howard Thin Client/LCD Wall Mount allows installers to mount any VESA compliant LCD monitor (15″ to 22″) and a thin client to virtually any vertical surface. This is perfect for digital advertising, touch screens, Kiosk interfaces, and much more. The two-piece self-locking unit installs in minutes with an extremely low profile. Depending on the size and make of your monitor, the mounting system has a 15-30 degree tilt up or down. The Thin Client Wall Mount offers unprecedented venting to ensure your equipment stays cool and operating at peak performance. For added security use a standard padlock to prevent tampering. 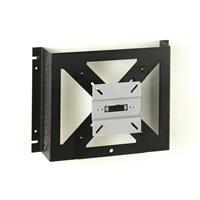 Add a sleek and professional look to your installation with the Thin Client/LCD Wall Mount.